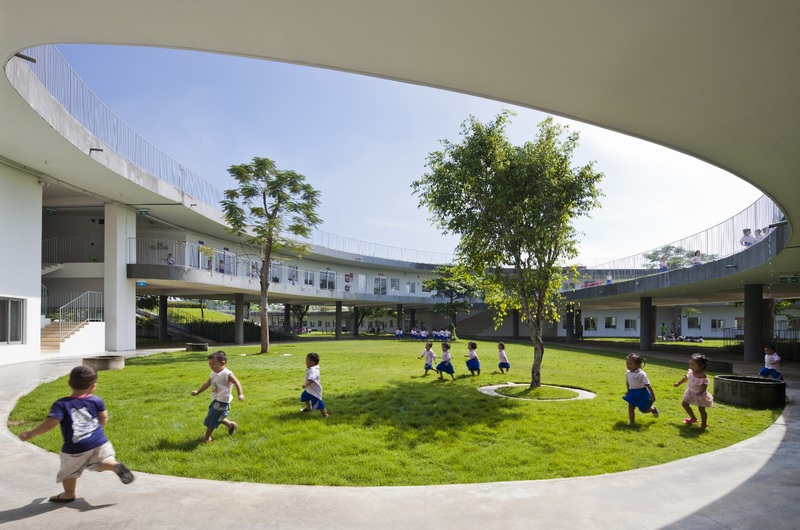 Description: « Taking nature back to the city », for the children of shoe factory workers, this exceptional pre-school designed by Vo Trong Nghia Architects in Vietnam uses about 25% less energy than a standard Vietnamese kindergarten would, according to the firm. Gaps in the 3,800 square metre structure help to generate cross breezes, meaning that the need for air conditioning is minimal despite the tropical climate. Other design details of the white, looping building include solar water heaters, an insulating green roof (equipped with vegetable garden), and wastewater that’s been recycled from the adjacent factory is used for irrigation. These efficiency measures translate into significant annual savings on operating costs. The 500 pre-school children who attend the kindergarten benefit from an environmental education at their fingertips. Can you summarize the Farming Kindergarten project in one sentence? It is a model of an educational building for a South-East Asian city, which has a tropical climate but is losing activity space for children due to urban development. Where did the inspiration for the Farming Kindergarten come from? The idea of fluidity of the energy circulation and children’s physical activities were linked to the architectural form to realize a sustainable educational space. How do you see the future of Vo Trong Nghia Architects (in particular its ‘green’ projects)? Currently our target is « Green our Earth » in order to bring back nature to the city, utilizing plants as a material of the building and component of the sustainable building to reduce energy consumption. Many Vietnamese parents send their kids to public schools. But in the drab industrial city of Bien Hoa, some workers at a Taiwanese-owned shoe factory send their little ones to a private kindergarten—one where grass, flowers and vegetables grow on the roof. The building cuts an unusual figure in a landscape dominated by factory smokestacks. Little Flowers Kindergarten is the product of an architectural competition launched by Pou Chen Group, a Taiwanese footwear manufacturer that employs about 20,000 people at its Bien Hoa factory. It was designed by Vo Trong Nghia Architects, a Vietnamese firm known for its environmentally conscious designs, and sits behind the factory’s parking lot. The school—a continuous white building that loops, in oval-shaped ellipses, around three courtyards—is a study in environmental sustainability and cost reduction. Gaps in the structure help to generate cross breezes, for example, and the garden hoses on the roof spray wastewater that’s been recycled from the adjacent factory. 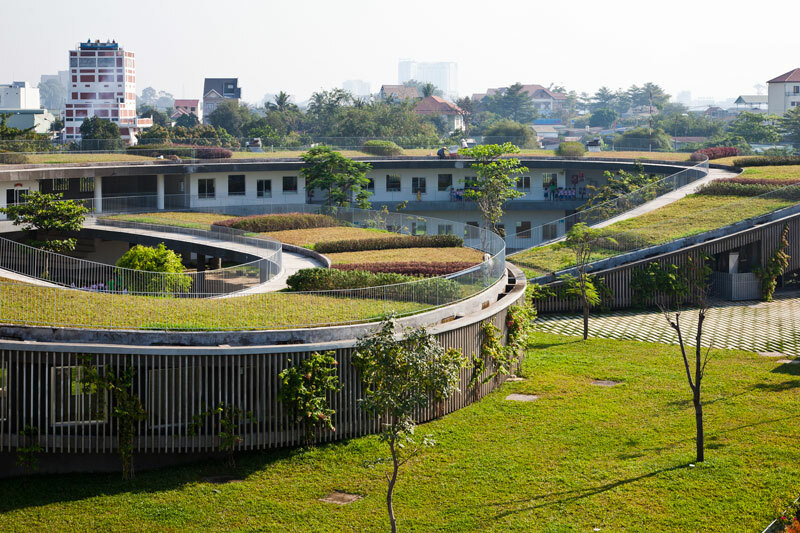 Thanks to these and other design details, including solar water heaters and an insulating green roof, the school uses about 25 and 40 percent less energy and fresh water, respectively, than a standard Vietnamese kindergarten would, according to Kosuke Nishijima, a partner at Vo Trong Nghia Architects. Those efficiency measures translate into an annual savings of 120 million Vietnam dong (US$5,400) on operating costs, said another partner at the firm, Takashi Niwa. 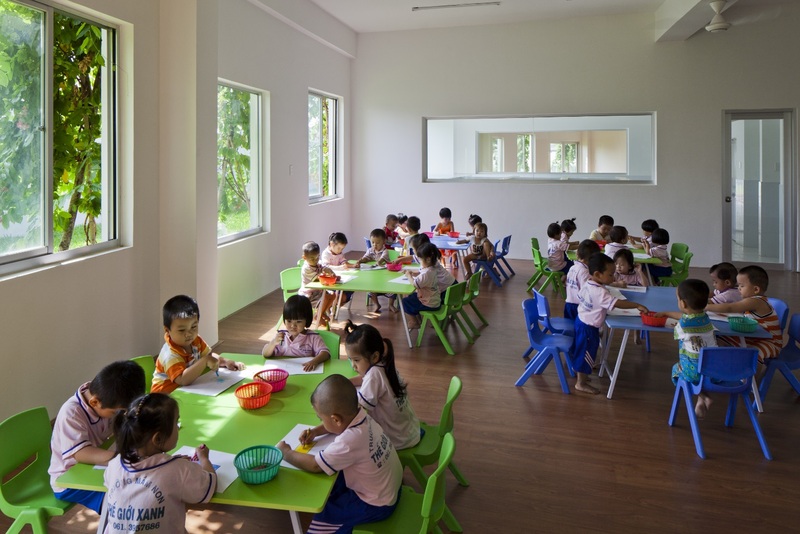 Vo Trong Nghia Architects said building the Little Flowers school cost the Taiwanese firm about 43 billion Vietnam dong, or about US$1.9 million, including an architect’s fee of close to 9 percent. It has a gross floor area of nearly 4,000 square meters and was designed to hold 500 students. The building, completed in 2013, has minimal air-conditioning, even though Vietnam has a tropical climate. 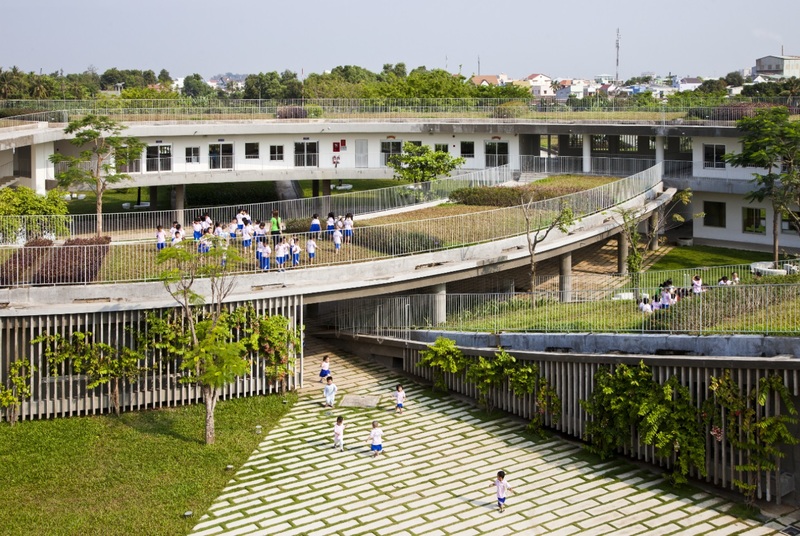 But architect Vo Trong Nghia said its exterior concrete louvers and general orientation—in the path of the area’s prevailing winds—help to regulate temperatures inside the classrooms. 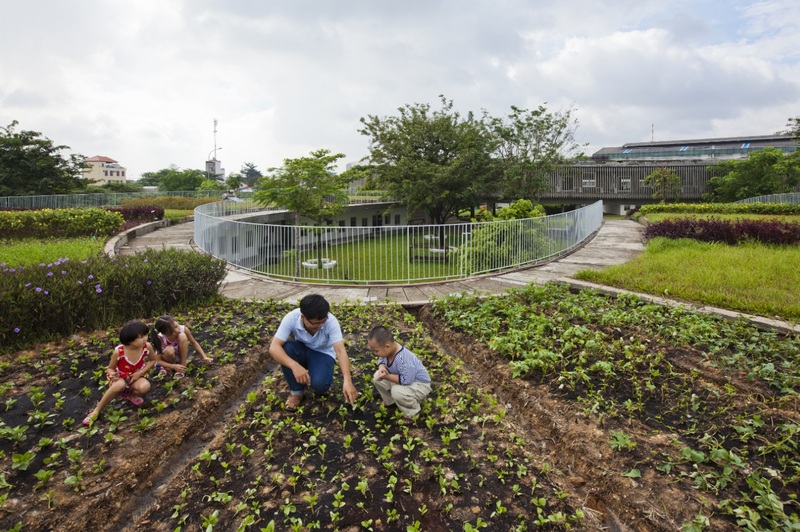 Nghia said one aim of his “farming kindergarten” was to teach children about agriculture and environmental sustainability through practical applications—the undulating green roof includes a small, and growing, vegetable garden. But the primary goal, he added, was simply to create a place where they could roam around and interact with nature. 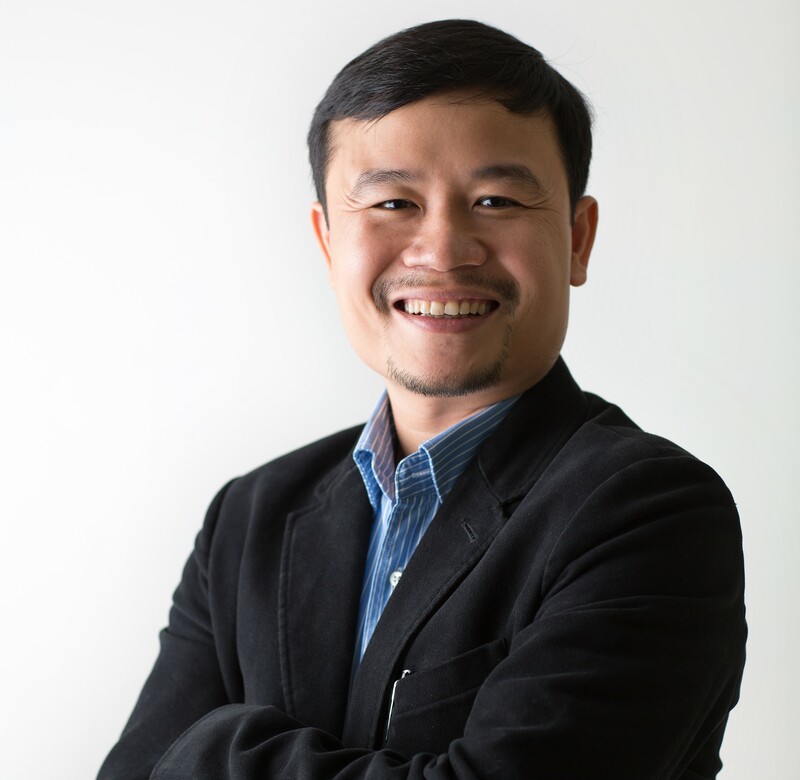 Nghia, 38, is among Vietnam’s best-known contemporary architects. He has cited Tadao Ando and other minimalist Japanese architects as major influences, but his work also reflects an appreciation for a tropical climate and Vietnamese architectural motifs. Among his most recognizable projects in Ho Chi Minh City are “Stacking Green,” a play on the traditional Vietnamese “tube house” in which open-air gardening beds—rather than glass and concrete—separate a home from the outside world, and “House for Trees,” a residence where trees sprout from rooftops. His current projects include a planned university campus in Ho Chi Minh City with a tree-covered building designed to resemble a hilly forest, and a plan to mass-produce a lightweight, 22-square-meter home and sell it across the developing world. Nghia said the home, called the “S House,” would cost as little as US$1,500 and be designed to withstand tropical storms. Nghia said he was also lobbying the Vietnamese government to draft planning laws that would require urban projects to include a minimum of green space. But officials, he added, have not yet expressed much interest. On a recent Tuesday afternoon at Little Flowers, dragonflies and butterflies were circling the school’s courtyards as the sounds of giggling wafted out of classrooms. In a nearby garden patch on the ground level, spider plants were growing from Coca-Cola bottles, underscoring the school’s emphasis on recycling and sustainability. Principal Hoa said teachers enjoy working at the school because students tend to be very relaxed in the classroom after enjoying so much outdoor playtime, and that there is fierce competition for spots on class rosters. “Only the best workers at the factory get to send their kids here,” she said. “It’s very smart of Pou Chen” because the policy encourages productivity on the assembly line. There are only two downsides, she said. One is that the school is so close to nature that children must share their courtyards with neighbors from the animal kingdom—such as bees and snakes. And because the children are so small, she added, they aren’t very productive farmers. The school’s green roof may eventually be covered in vegetables. But for now, it is mostly just grass. De nombreux parents vietnamiens envoient leurs enfants dans des écoles publiques. Toutefois, dans la terne ville industrielle de Bien Hoa, certains travailleurs d’une usine de fabrication de chaussures taïwanaise préfèrent mettre leurs petits dans une école maternelle privée, où l’herbe, les fleurs et les légumes poussent sur le toit. Le bâtiment se démarque dans un paysage dominé par les cheminées d’usine. L’école maternelle “ Little Flowers” est le produit d’un concours d’architecture lancé par Pou Chen Group, un fabricant de chaussures taïwanais qui emploie près de 20 000 personnes dans son usine de Bien Hoa. Elle a été conçue par Vo Trong Nghia Architects, un cabinet d’architectes vietnamien connu pour ses conceptions soucieuses de l’écologie, et elle se trouve à l’arrière du parking de l’usine. L’école, un bâtiment blanc d’un seul bloc qui entoure trois cours en suivant des ellipses de forme ovale, est le résultat d’une étude en protection de l’environnement et réduction des coûts. Les ouvertures dans la structure, par exemple, permettent de créer des courants d’air, et les tuyaux de jardinage présents sur le toit pulvérisent des eaux usées recyclées en provenance de l’usine adjacente. Grâce à ces installations et à d’autres détails de construction, tels que les chauffe-eau solaires et des toitures végétales isolantes, l’école utilise environ 25 à 40 pourcent d’énergie et d’eau fraîche en moins qu’une maternelle vietnamienne normale, fait remarquer Kosuke Nishijima, un partenaire de Vo Trong Nghia Architects. Ces mesures s’avèrent efficaces et permettent de réaliser une économie annuelle de 120 millions de dong (5 400 US$) de coûts opérationnels, déclare un autre partenaire de la société Takashi Niwa. Selon Vo Trong Nghia Architects, la construction de l’école “Little Flowers” coûte à la société taïwanaise environ 43 milliards de dong, ou 1,9 millions de US$, avec des coûts architecturaux avoisinant les 9 pourcent. La superficie totale fait presque 4 000 m2 et fut conçue pour accueillir 500 élèves. Le bâtiment, terminé en 2013, utilise un minimum de climatisation, alors que le Vietnam a un climat tropical. L’architecte Vo Trong Nghia explique que ses jalousies extérieures en béton et leur orientation, soit dans le sens des vents dominants, permettent de réguler les températures à l’intérieur des classes. Pour Nghia l’un des buts de cette “maternelle agricole” était d’enseigner aux enfants l’agriculture et la protection de l’environnement au moyen d’applications pratiques : le toit végétal ondulé comprend un petit potager. Cependant le but principal était de créer un espace où ils pourraient se promener et être en contact avec la nature. Nghia, 38, est l’un des architectes contemporains les plus connus du Vietnam. Il dit avoir été particulièrement influencé par Tadao Ando et d’autres architectes japonais minimalistes. Néanmoins, son travail reflète une appréciation du climat tropical et des motifs architecturaux vietnamiens. Parmi ses projets les plus reconnus à Ho Chi Minh on compte “Stacking Green”, une variation de la “maison en tube” traditionnelle vietnamienne dotée de parterres de jardinage à ciel ouvert, au lieu de béton et de verre, aux fins de séparer la maison du monde extérieur, ainsi que la “House for Trees,” une résidence où les arbres poussent sur le toit. Ses projets actuels comprennent un campus universitaire à Ho Chi Minh doté d’un bâtiment recouvert d’arbres afin de ressembler à une forêt sur une colline et un plan pour la production de masse d’une maison légère de 22 m2 afin de la vendre dans les pays en voie de développement. Nghia insiste que cette “S House” ne coûterait que 1 500 US$ et serait conçue pour résister aux tempêtes tropicales. Nghia a dit également qu’il faisait pression sur le gouvernement vietnamien afin de mettre en place des lois d’urbanisation qui exigeraient que les projets urbains incluent un minimum d’espaces verts. Mais les fonctionnaires n’ont toutefois pas encore exprimé d’intérêt face à cette proposition. Récemment, un mardi après-midi, on pouvait voir des libellules et des papillons voltigeaient autour des cours de Little Flowers, tandis que des rires d’enfants parvenaient depuis les salles de classe. Dans un petit jardin aux alentours, au rez-de-chaussée, des plantes araignées poussaient dans des bouteilles de Coca-Cola, soulignant encore une fois l’importance accordée par l’école au recyclage et à la durabilité. Le Directeur Hoa affirme que les professeurs aiment travailler dans cette école, car les élèves sont très calmes en classe, après avoir passé un si bon moment à la récréation. Il y a d’ailleurs une compétition féroce pour obtenir des places dans les classes. “Seuls les meilleurs employés de l’usine peuvent y envoyer leurs enfants”, déclare-t-elle. “C’est très intelligent de la part de Pou Chen” car cette politique encourage la productivité sur la chaîne de montage. Il existe deux inconvénients selon elle : l’école est si proche de la nature que les enfants doivent partager leurs cours avec des voisins du monde animal, tels que les abeilles et les serpents. En outre, étant donné leur âge, ils ne sont pas des agriculteurs très productifs. Le toit vert de l’école pourra un jour être recouvert de légumes, mais pour l’heure, seule l’herbe y pousse.